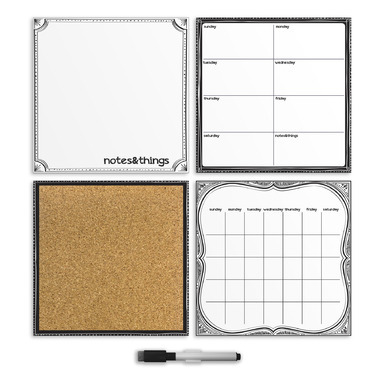 Get organized and look sharp with this chic WallPops White Dry Erase Organization Kit. The timeless contrast of black and white lends a clean and stylish look to walls while also providing the perfect space to stay on top of a busy schedule. A dry-erase monthly calendar, weekly planner and message board are accompanied by a cork board to tack up memories, photos and more. The kit also includes 6 oversized pins to add your own photos, keepsakes and more to the wall. Includes four 13" x 13" and a dry erase marker. Peel & stick, repositionable and fully removable.